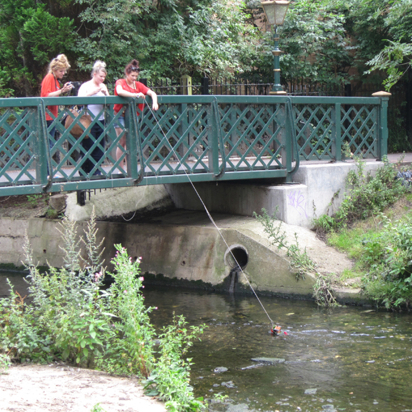 ‘River Adventure’ Young people create floating artworks to send down the Hogsmill River as part of IYAF 2011. The Hogsmill riverbank, immortalised in Millais’ famous painting of Ophelia, became the focus of two special visual art projects for IYAF 2011 – A View Through a Bridge and River Adventure. The former saw pupils from St John’s Primary School drawing individual view points through the Blue Bridge, which when pieced together and exhibited became an full-size drawing of a view through the bridge. River Adventure involved a series of workshops in which young people from the Anstee Bridge Programme created floating artworks to be sent down the Hogsmill from the Gallery towards the Blue Bridge and onward. Documentation took place at every stage and, with the support of Kingston University Fine Art graduate, Steve Nice, was compiled into a film of their experiences, which was played at the Gallery throughout IYAF.